The Burlington Walk Bike Council (BWBC) respectfully submits to you a number of recommended modifications to the design for the Champlain Parkway Project (Parkway). These recommendations transform the current unacceptable design to a walkable and bikeable configuration with highest safety for all modes. We want to express in the strongest terms how urgently the design needs to be modified. The Parkway, if built, will represent a major public investment in our community, with effects that will last far into the future. It is therefore essential that the design reflect current visions for the City and for the South End in particular, and that it promote the highest safety for all transportation modes as well as sustainable community principles. Certainly we do not want this project to build in features that later cry out to be modified or removed. The Vision and Goals recently adopted as part of the North Avenue Corridor Study represent a new Burlington community standard for transportation, including walking and bicycling infrastructure. 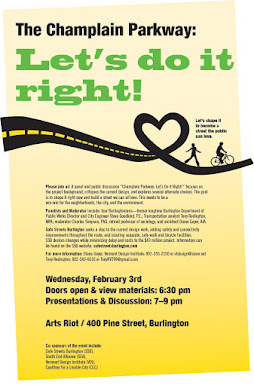 One particular goal summarizes this new thinking: “Achieve a world class transportation corridor that offers quality of service and highest safety for those who walk, bicycle, and travel by motor vehicle or transit.” Support for multi-modal transportation and safety is also incorporated into many other city plans and documents, including Plan BTV, the Transportation Plan, the Climate Action Plan, and the recent Burlington “Go For Gold” Strategic Plan. The current design for the Parkway does not succeed in reflecting this vision. While it does include a mixed-use path for cyclists and pedestrians for much of its length, it does not adequately protect safety for all modes, and also does not promote sustainable community principles.  Lack of adequate accommodation for cyclists on Pine St. between Kilburn St. and Maple St. The long term vision for this corridor should be a complete street with separated sidewalks and protected bikes lanes/cycle track (preferably on both sides of the roadway), roundabouts at all major intersections, and safe pedestrian and cyclist crossings. It should also enhance connections with surrounding neighborhoods and create an attractive people-friendly streetscape. The attached document provides detailed recommendations for bringing the design in line with this long-term vision. This is a once-in-a-lifetime opportunity to accelerate meaningful walk-bike investment in our City to benefit the overall community and the neighborhoods directly affected. While improving the present design’s safety, we can avoid isolating any of our existing neighborhoods and improve the connectivity and flow of all traffic modes throughout the South End. This in turn can help reduce pollution and greenhouse gas emissions, increase economic activity along the corridor by slowing down traffic, and make it more pleasant for both walking and biking. We insist on a safe and complete street Parkway design, incorporating sustainable community principles. As difficult as it may be to enlist the cooperation of VTrans, FHWA and other partners to work together to make design modifications within the restrictions of the federal funding, please know it is critically important to do so. The current and 2028 numbers for each street section and each intersection are readily available in the Environmental Impact Statement (EIS) traffic chapter for the Champlain Parkway on the Department of Public Works website. Still looking at the Pine/Maple intersection where anyone familiar with that intersection well knows waiting 5-7 minutes going north on Pine during the afternoon peak is routine. Good time to get some internet time when on the Montpelier-Burlington Link! Still, a detailed look at the p.m. peak hours at the Maple/Pine intersection for 2028 with the new signal as planned there dismays. Why? Well, the traffic numbers 13 years hence are slightly above those today at Montpelier's downtown roundabout, Keck Circle, where peak hour delay a.m. and p.m. can be counted on a hand with three fingers. Yes, a roundabout--checked out by one of the foremost roundabout designers in the world as part of the AARP Workshop in September 2013 as both workable and feasible--would likely delay the average vehicle on a Friday drive time about 5-6 seconds in what is called "stop delay." This is not a fairy tale, the Parkway consultant, CHA will tell your their Keene, N.H. Main Street roundabout dropped the Winchester Street leg adjacent to Keene State College from six minutes to six seconds during drive times compared to a proposed signal. What in the world is wrong with our Department of Public Works that it will not install a roundabout at Pine/Maple next spring at the 10% of the cost of the Pine/Lakeside signal upgrade of $419,000? Why not? A traffic signal at Pine/Maple--part of the current Parkway design--will likely delay an average vehicle 20-30 seconds, about ten times the wait time at a roundabout there. What is far, far worse, the signal will generate more crashes and injuries over and above the four-way stop now in place (the four-way stop, next to the roundabout the safest intersection). So the signal promises a 20-30 second wait for everyone (pedestrians face no significant delay today) as well as an extra crash and injury or two each year. Why? Burlington already has the "dirty 17" intersections (13 signalized) averaging a pedestrian injury each per year and so the City in its wisdom clearly is on a crash course to install another signalized intersection (one of five new ones on the Parkway) sure to add to the City's transportation unsafety. Why? Champlain Parkway: Stop! Re-Evaluate! Re-Imagine!